This piece originally ran in Shelf Awareness for Readers. 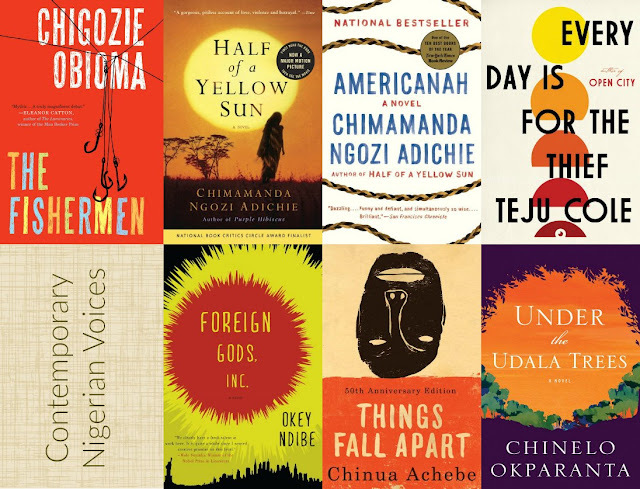 Until recently, I'm ashamed to admit, my reading of Nigerian authors was limited to the works of Chinua Achebe (which are certainly worth reading, if you haven't already). I had been overlooking a host of more recent fiction from Nigerian voices, all of which work to highlight the complex and often misunderstood history and culture of this unusual country. Chimamanda Ngozi Adichie's Half of a Yellow Sun provides an unflinching, heartbreaking account of the background and horrors of the Biafran War (known to some as the Nigerian Civil War) of the late 1960s. With beautiful prose and stunning descriptions of her country, Adichie's writing is not to be missed. That powerful writing is present again in Americanah, which explores the experience of a Nigerian immigrant coming to America, and is as astoundingly good as Half of a Yellow Sun. Teju Cole's second novel also centers on a Nigerian expatriate, using the experience of the narrator's return to his hometown of Lagos to highlight the corruption of the city. Peppered with photos taken by Cole, Every Day Is for the Thief is in every way a story of place, exploring themes of immigration and home and the complexity of both. Chigozie Obioma's debut novel, The Fishermen, was recently named to the shortlist for the 2015 Man Booker Prize for Fiction--and for good reason. Obioma's stunning novel centers on the lives of four young brothers whose lives are forever changed by an unexpected prophecy. Set against the background of a tumultuous and politically charged Nigeria in the 1990s, The Fishermen is a commanding story of time and place and destiny, and of coming of age in a particular moment in history. And that's just the tip of the iceberg. I'm considering picking up Okey Ndibe's Foreign Gods Inc. next, or perhaps Chinelo Okparanta's Under the Udala Trees. And then it might just be time for a re-read of Achebe's Things Fall Apart.